In 2015, Ferrari, named H.R. Owen as the best Ferrari dealership in the world, after the business scored the maximum number of points in all of the judging categories. Owen subsequently served for some years abroad, principally at Bombay, Karachi and Aden, before returning to Britain and beginning work at the National Benzole Company. A keen sportsman, Owen’s skill as a polo-player made him welcome at society house parties. This gave him many useful sales contacts when he joined Rolls-Royce and Bentley retailer Jack Barclay in 1927, becoming general manager a short while later. Harold Owen and Jack Barclay parted company amicably five years later when the former decided to start out on his own in motor retailing – though the two names would be linked once again 68 years later, when the two companies bearing their names were reunited. The new H.R. Owen Rolls-Royce and Bentley dealership opened in Mayfair’s Berkeley Street in February 1932 and continued trading until the outbreak of war, when luxury car retailing came to an enforced halt. Harold Owen fully intended to resume the motor retail business post-war, but he fell ill when on tank manoeuvres with his regiment, the 4th Queen’s Own Hussars, and died 17 February 1940, following an emergency operation to remove a brain tumour. Following Harold Owen’s death, the H.R. Owen business was bought by Percy Fritz Swain, who reopened the business in 1946 on the old location in Berkeley Street. An astute trader, Swain began to build a larger motor empire, buying up retailers as well as coachbuilders and suppliers. On the death of A.J. Webb in 1955, Swain bought coach builder Freestone and Webb. The post-war years were not kind to independent coachbuilders as prestige manufacturers such as Bentley and Rolls-Royce were obliged by advances such as monocoque construction (finally adopted in 1965 for their Silver Shadow and T-series cars) to shift from supplying only the chassis and drivetrain of a vehicle to building the complete car, bodywork and all. With Freestone and Webb’s main chassis supplier relationship coming to an end, the coachbuilding business continued to refurbish and build bodies until 1958, when it became only a name for a showroom. In 1997, on the 65th anniversary of H.R. Owen's foundation, Malaya Group changed its name to H.R. Owen plc. In 2000 the group bought Jack Barclay, thus becoming the world's largest dealer for Rolls-Royce and Bentley cars. Although the two brands were split at manufacturer level in 1998 between Rolls-Royce Motor Cars (bought by BMW Group), and Bentley (Volkswagen Group), H.R. Owen continues as a Rolls-Royce retailer, while Jack Barclay of Berkeley Square remains the world’s largest Bentley dealer. In 2004 the H.R. Owen group sold its Volkswagen and the majority of its BMW brand dealerships to their respective manufacturers. A year later the firm was appointed official UK dealer for Bugatti and by 2008 became the world’s largest Bugatti dealer. The company is quoted on the London Stock Exchange under the securities code HRO.L. Under the leadership of CEO Mamad Kashani-Akhavan, H.R. Owen continues its focus on customer service in the field of luxury and supercar retail, whilst extending the customer offering on new business areas including H.R. Owen Classic Cars, H.R. Owen Insurance Services, Luxury Hire and Chauffeur Drive. In 2014, H.R. Owen generated £400 million in revenue. 1 2 "About HR Owen". H.R. Owen. Retrieved 2016-06-04. 1 2 "HR Owen accepts improved Tan offer". Herald Scotland. 2013-09-14. Retrieved 2016-06-04. 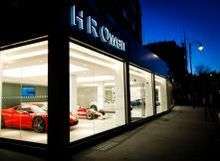 ↑ "HR Owen named as world's number one Ferrari dealer". AM-online. 2016-01-07. Retrieved 2016-06-04. ↑ "Company". H.R. Owen. Retrieved 2011-01-23. ↑ The Provincial Traction Company Limited. The Times, Monday, Jul 03, 1961; pg. 21; Issue 55123. ↑ AM100 analysis: Jardine Motors drives ahead with expansion, AM Online. ↑ "Business big shot: Nicholas Lancaster of HR Owen". The Times. December 31, 2009. Retrieved 2011-01-23. ↑ "HR Owen acquires Broughtons for £1.5m". Motor Trader. Retrieved 2014-02-06. ↑ "H.R. Owen recommends investors accept BPI takeover bid". Yahoo Finance. 13 September 2013. Retrieved 2014-02-06.